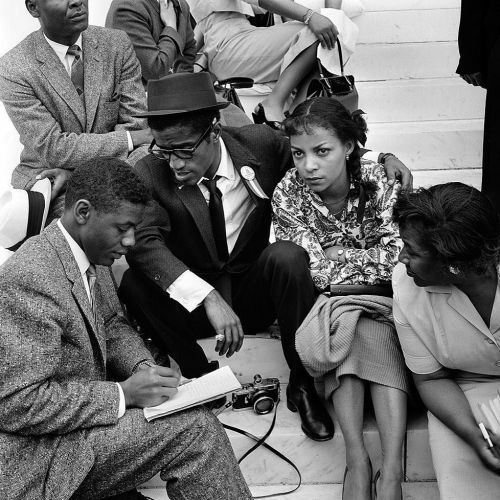 "Sammy Davis, Jr. and the actress Ruby Dee being interviewed at the Prayer Pilgrimage for Freedom at the Lincoln Memorial in #WashingtonDC in May 1957. Under cloudy skies, the assembly — which park police estimated to be a crowd of 15,000 — overflowed the memorial steps, spread over Memorial Circle and occupied the grass, around the end of the reflecting pool. The 3-hour demonstration was marked with speeches by prominent civil rights leaders, including one by the then 28-year-old preacher, the Rev. Martin Luther King Jr. The @nytimes wrote the following day that King received the biggest ovation of the afternoon and "appeared a hero to the pilgrims." @nytimes photographer George Tames took this photo, which came from our #archives. #MLKday" By nytimes on Instagram.